Appropriately and successfully introducing your new puppy to your older dog is critical! If this process is done wrong, you can end up with an injured puppy or a fractured relationship where they hate each other for a lifetime. Neither of those are great options! Most of the time, the acclimation process goes fairly smoothly. The majority of people just bring the puppy home and hope for the best. The problem is that sometimes “the best” doesn’t happen for the new puppy, existing well behaved dog and dog owner. I have seen puppies seriously injured, broken, and even killed by older or existing adult dogs. And, I think we can all agree that we want to avoid this at all cost. The truth is, I think in most of the above mentioned, sad scenario the aggressive behaviors could have been avoided or at least controlled. Yes, I will admit that some dogs simply aren’t going to accept sharing their space with another dog or new puppy. 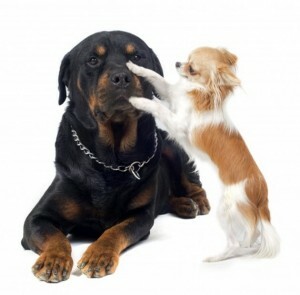 If you have a dog that is dog aggressive or has aggressive or reactive behavior tendencies; I would recommend you seek the advice of a local doggy day care facility, boarding facility or even a boarded veterinary animal behaviorist to see if your dog can peacefully coexist with a very submissive, or neutral dog or well behaved puppy. Trust me, the anguish of losing a puppy to your older dog isn’t worth the risk if you think it is a possibility. Beyond that, most dogs can at least be somewhat acclimated to a new puppy if the situation and training is handled correctly. Go into it knowing it is going to take some time. Imagine, if you will how your dog feels when you bring a new puppy home. He is probably happy being an “only child” and enjoying all of your attention and now he has to share everything he has with someone else. And, puppies require a lot of time and attention, making the change even more drastically felt by your dog. I can imagine that this brings stress and a feeling of helplessness, perhaps even a little depression. Yet dog owners don’t really consider or think about this when they want to bring a new puppy home. Putting yourself in your dog’s “paws” may at least help you to be more cognizant of how he is feeling and giving him space away from the puppy while making sure you are also spending one on one time with him. We love puppies! They are full of life and full of energy! It is amazing to watch them experience new things and develop. However, puppies can be very overwhelming to adult dogs, especially older dogs. Puppies don’t really come with a lot of respect of space and pain. For instance, you wouldn’t let your three year old run and jump on or bite your ninety five year old great grandmother. Yet we expect adult and older dogs to find puppy antics charming but not all dogs do! It is always important to constantly and consistently assess all dog’s behaviors and interactions. Doggy day care is also a great option for wearing out your puppy. Your local vet may offer boarding or day care or You can check out Rover.com. Introducing a puppy should be done carefully. First, I like to exhaust my new puppy prior to any introductions. Tired puppies are always more delightful than wild puppies. The excitement of the puppy meeting a new dog will be difficult enough to contain, so I suggest a good long walk or play session prior to the meeting. Pick neutral ground (not a park that you take your dog to all of the time) and put both dogs on leash. You may want a family member to hold the new puppy while introductions are initially made on neutral ground. First they should hold the young pup under their arm or at the waist so that both can get a look at one another. Provided there is no growling or aggressive behaviors the puppy can slowly be lowered for each to get a little sniff of one another. Harnesses can make this more helpful. Watch for signs of fear or aggressive behavior from either party. I remember introducing one of my young eight week old puppies to my existing dog; and the puppy was doing all of the growling. Respect a growl and give the other part more time to acclimate. Happy introductions are crucial. 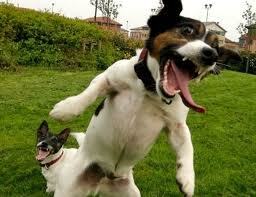 If there are no signs of fear or aggression from either dog the puppy can be set on the ground. 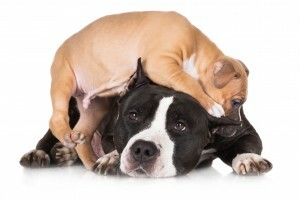 Steps should be taken to ensure the puppy does not pounce, jump on or bite the adult dog. Allow the adult dog to come into the puppy’s space if so desired. If the adult dog does not want to investigate the puppy he should not be forced to do so! Remember aim for a conflict free introduction, even if it takes time. I am a big believer in teaching my puppies respectable manners and how to interact with adult dogs so that they won’t cause the adult dog to bite or correct them. Some dog trainers and dog owners will tell you that the adult dog should just correct the puppy and teach him, himself. However, again, I have seen adult dog that can seriously hurt a puppy with a misplaced, misguided, or angry bite. Size of the dog matters of course, a Yorkshire Terrier bite is much smaller than that of a Pitbull Terrier. Once the initial meeting has occurred and hopefully everyone is getting along, you may take them home. Allow your existing adult dog to be off leash and in whatever space he so chooses. It is your goal to make life as normal as possible for him as you continue to integrate your new pup. But, keep the puppy on a leash. Leashes are essential in teaching manners and conditioning good behavior from the beginning! It will be a bit exhausting keeping your puppy on leash in the house but it will prevent him from annoying your other dog, cat, pet or other family members. It will also prevent him from developing other bad behaviors like stealing items he shouldn’t have or chewing on your things. Let’s face it, you aren’t going to allow your puppy to eat the sofa, a sock, or your carpet if he is on a leash and tethered to you. You are also going to notice when he needs to go outside and go potty, so this is also critical for quick puppy potty training. If your adult dog wants to interact with the new puppy, he can come into his and your space and initiate interaction or play. Leash training in the house will also help with puppy potty training, you will know when to take him outside. You can also teach him to go inside in an indoor litter box or grass potty box if you have a small dog and you prefer this type of training. Dog Crates are essential to good dog training and ownership. Crates keep puppies safe when you are not able to keep an eye on them. Last week, in the veterinary hospital I work at, we had two puppies come in that needed emergency surgery to have items cut out of their stomachs. Dog crate training will also help your existing adult dog feel normal and maintain his space while giving him a break from the pup. During this time you can spend some special one on one time with your original dog. Crates also aid in potty training. 90% of puppies don’t want to make a mess in their crate and sit in it. I have a current client who called in a panic because the puppy they have had for less than a week, who was doing well with potty training, started having accidents one day. The day in question was really cold and our first snow of the year. Simply, the puppy didn’t want to be outside in the cold and find a place to potty, so he waited until he came inside and was put behind his baby gate to go potty. It was natural for the pup to want to potty where it was warm. The owners were in a panic, I got several text messages late one night. I suggested crating him if he didn’t go potty outside, but they were worried about him making a mess in his crate. Whereas, I understand and empathize; sometimes you have to make a mistake in order to understand that you don’t ever want to do that again. Crates can be crucial in teaching this lesson very quickly. Impact makes my favorite crate and no dog can get out. I don’t mind baby gates and play pen areas being utilized once your puppy is essentially potty trained. But larger spaces that you aren’t consistently monitoring can encourage potty accidents. 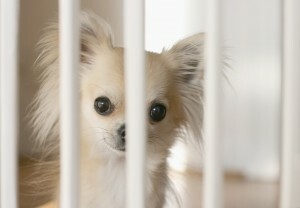 It is much better to sneak off to the corner of a room or the corner of a play pen and have an accident, than it is to have an accident in your crate. However, if there is animosity within the pack between your dog or dogs and the new addition a baby gated area or play pen can give everyone a little space and a good place to be. Let’s face it, your existing dog is going to want to sit with you and spend time with you like he did prior to the arrival of the new furry package, and if he doesn’t like the new puppy; having the puppy with you constantly might cause some more animosity. So utilizing a play pen for short periods of time can allow the puppy to chew on some appropriate items or take a nap while the dogs get used to spending time together without feeling forced. After all, if they aren’t getting along well forced interaction is only going to make it worse. Calm, quiet, controlled and well behaved interaction is what will help build a better and less stressful relationship. Even if your adult dog and your new pup are getting along famously, be sure to give them both breaks. Everyone needs a break and some alone time. Even the happiest couples spend time by themselves and enjoy their own hobbies. Remember your dogs need breaks too in order to have good mental health. I feel sorry for dogs that can’t exist without the other pack member. We see this a lot in the dog training and veterinary world. At least in the dog training world we can work to get dogs separated and acclimated to being alone and solo for training and spending time with their owners. In the veterinary world we see the entire miserable part of this equation when one dog dies and the other dog is left alone without any acclimation. Dogs can and do suffer from severe depression when they have lost a loved one, especially when it was another dog from their pack. Please do your dogs a favor and give them separate one on one time throughout their lives. Give them independent training and bonding time with you. It is best for everyone’s mental health to have some moments to be autonomous. Remember your puppy needs positive reinforcement, conditioning and guidance in order to learn what you like and how your dog’s behavior relates in certain situations. So often we are quick to tell our puppies when they are doing something wrong and so few people do the opposite and tell their puppies when they are doing something right. Imagine starting a new job, in a new country where you don’t speak the language and only getting yelled at and corrected when you do something that they deem “wrong” even if it is something you think is “good”. It would be super frustrating. I want to know I am doing the right thing and doing a good job in order to excel in my work. Treat your puppy the same. 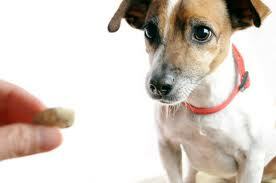 Reward him with wonderful, yummy treats for not pouncing you other pet, cat or dog. Reward him with treats for keeping four on the floor and not jumping on you. Reward him with treats for sitting and laying down even if he is doing so on his own terms. Reward him with treats for all good choices that you like and you will end up with a dog that has a clear and concise picture of what behaviors you like and what behaviors you don’t like. Most dogs are people pleasers and want to do what you want, but there should be a good pay out and clear and consistent terms that they can understand. If you are getting a puppy, I strongly suggest that you follow this guide. Even if things go as planned and both pup and adult dog get along well it is critical to build a strong foundation where you are conditioning good behaviors and doing positive reinforcement. After all, positive reinforcement and conditioning good behaviors will build a strong and loyal canine companion for a lifetime. Get started clicker training! The Clik-R is great because you can put it on your finger so it frees up your hands!